Nancy Arlen, Comet, 1981, polyester resin, pigment, dimensions variable. Installation view. The most provocative moments of this exhibition ask viewers to rethink their own canon(s) via a superb selection of works from artists mostly marginalized from the annals of art. Works rhyme across the vast space of this gallery—and some are nearly swallowed up by it. Two Cameron drawings (from the series “Pluto Transiting the Twelfth House,” 1978–86, and “Untitled (from the Lion Path series),” n.d.) find echoes in paintings on canvas by Magalie Comeau and a black Jay DeFeo painting on paper, the latter sadly confined to a dim cul-de-sac build-out. Bill Hayden’s carved Oryx horn sculpture, ohoui, 2012, relates to the haptic materiality of Harold Mendez’s I did not become someone different / That I did not want to be, 2016, which brings together reclaimed iron, fern moss coconut fiber, and lemon-lime Kool-Aid in the form of a lofty crown on a pole. Jean-Léon Gérôme’s Amor Holding the Mask of Medusa, ca. 1887, and John Singer Sargent’s plaster Crucifix, 1890, represent the quixotic attempt to bring the patriarchy (whether of academic painting or religion) into an already eclectic roster. The standouts are many: Yuji Agematsu’s sequence of cigarette wrapper assemblages, zip: 09.01.06…09.30.06, one for every day of the month of September, 2006, are delicate clearinghouses for the small bits of stuff the artist culled from the streets of New York. 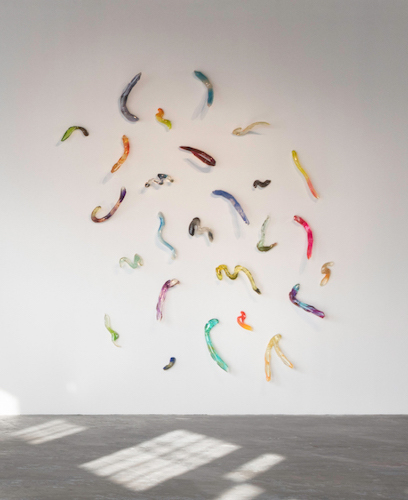 Nancy Arlen and Deborah Remington also make strong showings, the former with Comet, 1981, made up of more than two dozen brightly-colored polyester resin boomerang-like forms, and the latter with an ink drawing from 1959 and two of her soot paintings from the early 1960s. These paintings’ tight, mechanical compactness provide a useful rejoinder to the sprawling, ambitious context they are placed in.